I signed up to the club only a couple of weeks back, but bought myself a Jersey and represented in a couple of races last week. I entered this, only my 3rd race, with zero expectations for a result (I’m no sprinter by any stretch of the imagination) but eager to build up my racecraft. With absolutely no experience or knowledge of my fellow competitors, I resorted to arbitrarily picking out who I thought the riders to watch were during the briefing, and promptly kept myself on their wheels after the roll-out. Amazingly my selection transpired to be vaguely correct, and I found myself mixing it up in the top 10 to 15 riders for much of the first half of the race, posting myself on the front for a couple of token efforts to legitimize my placing. The fast, flat course meant that most attacks amounted to very little, barring one guy who managed to clip off into the distance, never to be seen again (Chapeau!). The race was about 20 laps of the business park, meaning 20 times to work out the best positioning for the last lap. Armed with an awful sprint, I figured that if I could be near the front as the sprint opens, I might be able to hang on and score a few points. With a plan at hand, I worked my way up to 3rd or 4th wheel for the bell, and set about defending my place on the road like a kid guarding sweets. Entering the final few hundred meters, I found myself 4th wheel, well positioned on the road and with a totally clear space to sprint into on my right. Had this plan actually worked? I patiently held on as late I dare (and then some) before opening the taps, then moved into the space to my right, which amazingly was still there. I experienced a very alien, unexpected sensation when I looked to my sides and realized I was headed for the line at the front of the bunch! Though pipped in the final few meters by another rider, I held on for 3rd, far better than I’d ever expected and enough to get me out of Cat 4s – Happy days! 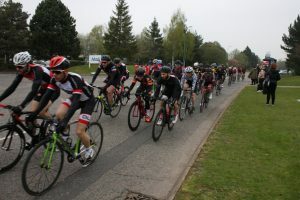 8 Wheelers tackled the Mad March Hare Sportive on Sunday from a new location at Longbridge, Brum. Weather conditions were good for a brisk ride, sunny, dry and ideal for spring/summer bikes. Winter kit was still needed apart from the hardened Scot who turned up armwarmer-less. Fiona, Philip & Chris all started earlier than the remaining 5, the hares were off and cycling…. Carl, Michael, Dave, Andy and Andrew all kicked off around 9am from the rear of the field, which meant the first 30k cutting through the bike traffic along narrow country lanes. 4 of the team of 5 passed the only food stop at 55k deciding to plough on past more of the field. Soon after, Carl took on the lead and put the hammer down for much of the remainder of the ride. The rest of us hung on for as long as possible as the relentless pace and rolling hills just kept giving! All the effort paid off in the end with a Wheelers 1, 2, 3 & 5! Well done to all the guys and girls flying the Wheelers flag. Highly recommend this very well organised sportive, wish I could comment more on the beautiful scenic route but I spent most of the time looking at Carl’s rear end and blowing out mine! 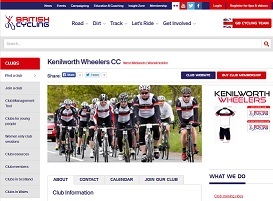 This Sunday 7th October 2018 Kenilworth Wheelers are riding as a club United in the member of Peter Baum. To us he was a club mate and friend. To others he was a husband, dad, brother and uncle among many things. 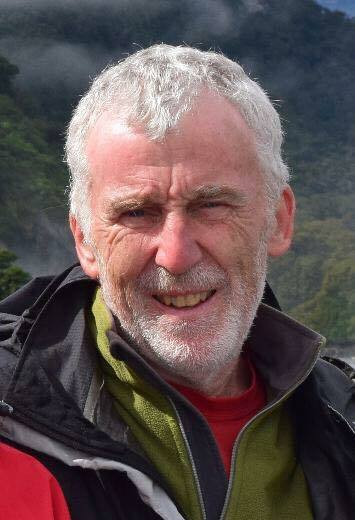 To all he was a man who loved cycling so it is fitting that we will share in his passion while we remember him. 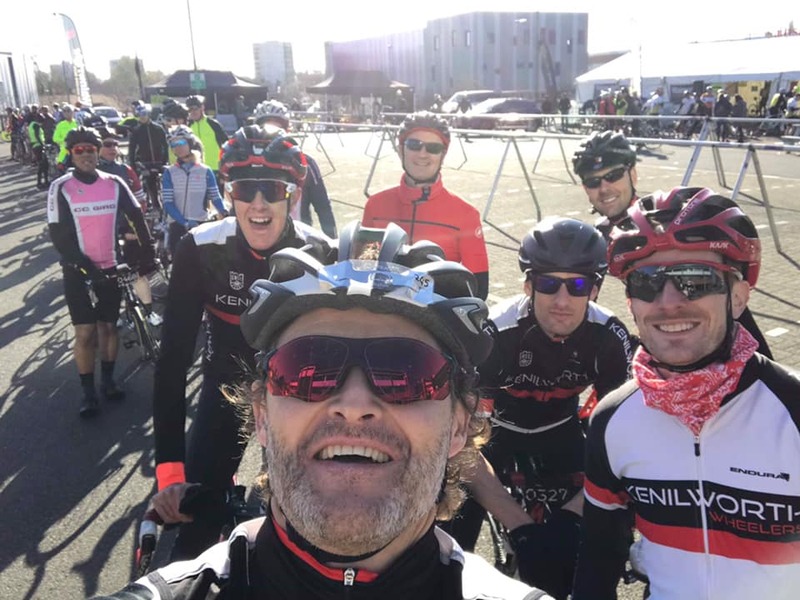 A big group of members took part in the 2017 Lincoln GP Sportive at the weekend. A gruelling 98 miles and 4500ft of climbing completed with all riders getting round. Latest summary list of weekly club runs. Evening rides are a fixed route – lights now required!. Keep an eye on the Facebook group for ride updates.